Calling all Heinz Baked Beans lovers (and let’s be honest isn’t that everyone?) Selfridges is celebrating the iconic brand with a special four week pop- up. It’s to mark 50 years since advertising legend Maurice Drake came up with the immortal strapline ‘Beanz, Meanz, Heinz‘ and changed our relationship with stewed tomato sauce forever. On offer is a tub of hot beans with either scrambled eggs, bacon or ham with cheese for £3 a pop. Yes, that is way more than a tin would cost in the supermarket so it’s a bit of an extravagence but it is fun – and tasty. 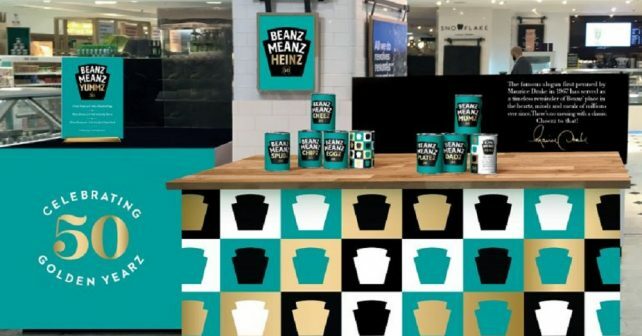 If you class yourself as a Heinz Beans obsessive then take note; on 5th April the company are also selling 50 limited edtion £10 collectible cans via the Foodhall and Selfridges website. Each one is signed by Mr Drake and all proceeds go to the Ideas Foundation. Unsigned commemorative tins – featuring the three-word slogan – will also be sold throughout Selfridges for £2 each. Now until 23rd April. No need to book, just show up and chow down!